Gulf Coast Regional Blood Center supplies the majority of local hospitals in the Houston metro area. Fall is tough for the community’s blood supply, because donor turnout can be low due to school activities and holidays. Blood products are used daily in hospitals to support patients who are in trauma, actively bleeding, undergoing surgeries, cancer treatment, and a variety of other medical reasons. About 1,000 donations of blood are needed every day to meet the community’s needs. In less than an hour, a donor may save 3 lives! 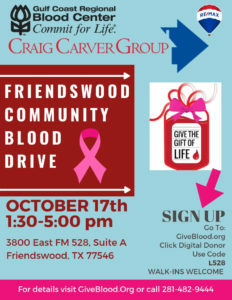 Since blood is transfused anytime — 24 hours a day, 7 days a week, 365 days a year, Gulf Coast Regional Blood Center has set up a Friendswood Community Blood Drive at the Craig Carver Group located at 3800. 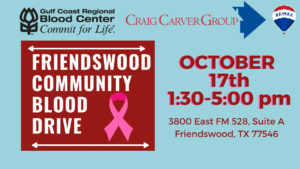 East FM 528, Friendswood, TX 77546 on October 17, 2018 from 1:30-5pm. Their goal is to collect as much blood as possible to boost the community’s blood supply to support the patients in our hospitals who depend on blood transfusions to heal. October is also Breast Cancer Awareness. Please come out and learn more about the cause and ways to support local Breast Cancer Thrivers and Survivors. For more information, call 281-482-9444 or register at GiveBlood.org, Click Digital Donor, Code L528.